What does it mean that the earthquake occurred at a depth of 0 km? How can an earthquake have a negative depth; that would mean it’s in the air. 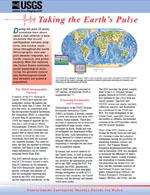 What is the geoid, and what does it have to do with earthquake depth? An earthquake cannot physically occur at a depth of 0 km or -1km (above the surface of the earth). In order for an earthquake to occur, two blocks of crust must slip past one another, and it is impossible for this to happen at or above the surface of the earth. So why do we report that the earthquake occurred at a depth of 0 km or event as a negative depth sometimes? First of all, the depth of an earthquake is usually the most difficult part of its location to nail down with great accuracy. Since most earthquakes are deep within the crust, an error of +/- 1 or 2 km is irrelevant; in other words, it is a small error when the depth is something like 13 km. If the earthquake depth is relatively shallow, however, it becomes more of an issue. A negative depth can sometimes be an artifact of the poor resolution for a shallow event. For quarry blasts that are recorded by the seismic network, the depth is fixed at 0 km since we can never determine a precise depth for these, but we know they are very close to the surface. Sometimes, because of the density of the seismic network and the close proximity of the seismic stations to an earthquake epicenter, we are able to determine a very precise depth. 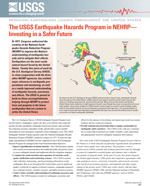 When the earthquake depth is very shallow, it can be reported as a negative depth. Earthquake depths are calculated relative to the World Geodetic System of 1984 (WGS84) geoid, mean sea-level, or the average elevation of the seismic stations that provided arrival-time data for the earthquake location. The choice of reference depth is dependent on the method used to locate the earthquake, which varies by seismic network. 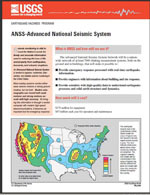 The USGS National Earthquake Information Center (NEIC) currently uses the reference geoid called WGS84, but since the Comprehensive Earthquake Catalog (ComCat) includes data from many different seismic networks, the process for determining the depth is different for different events. The depth is the least-constrained parameter in the earthquake location, and the error bars are generally larger than the variation due to different depth determination methods. What is a Geoid? Why do we use it and where does its shape come from? 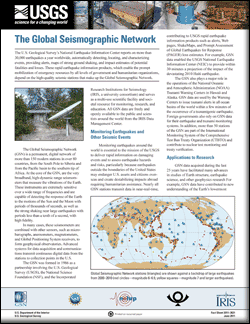 Seismometers, seismographs, seismograms - what's the difference? How do they work? How can I make my own seismometer? What was the first instrument that actually recorded an earthquake? What was the duration of the earthquake? Why don't you report the duration of each earthquake? How does the duration affect the magnitude? How can an earthquake have a negative magnitude? How are earthquakes recorded? How are earthquakes measured? How is the magnitude of an earthquake determined? Moment magnitude, Richter scale - what are the different magnitude scales, and why are there so many? What is the difference between magnitude and intensity? What is the Modified Mercalli Intensity Scale? 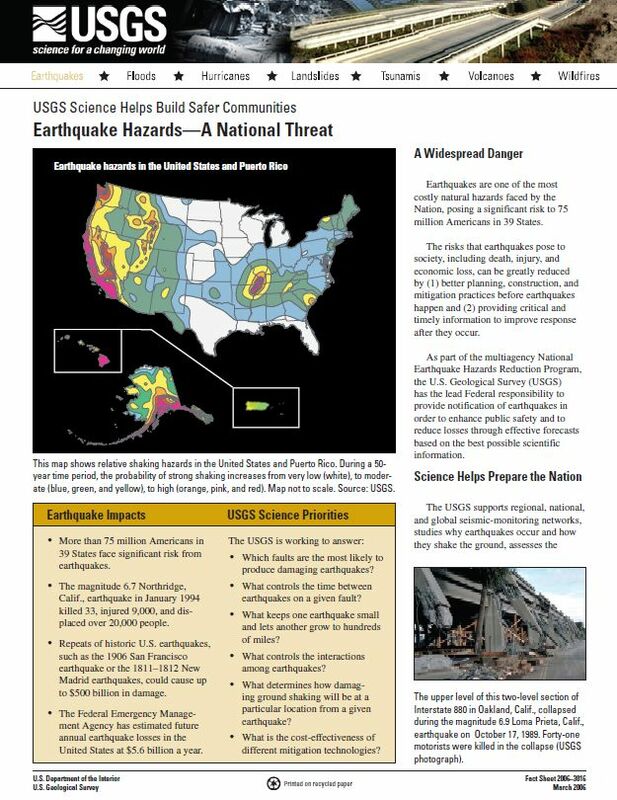 How do you determine the magnitude for an earthquake that occurred prior to the creation of the magnitude scale? 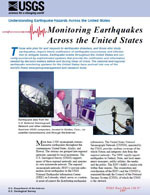 Buland, Ray P.; Benz, Harley Mitchell; Brown, William M.
Monitoring earthquakes across the United States; 1997; FS; 146-97; Buland, Ray P.; Benz, Harley Mitchell; Brown, William M.
USGS will Grant Universities $5 Million to Beef Up Public Safety Grants totaling $5 million under the American Recovery and Reinvestment Act are being awarded to 13 universities nationwide to upgrade critical earthquake monitoring networks and increase public safety. USGS map displaying intensity of potential ground shaking from natural and human-induced earthquakes. There is a small chance (one percent) that ground shaking intensity will occur at this level or higher. There is a greater chance (99 percent) that ground shaking will be lower than what is displayed in these maps. USGS map displaying potential to experience damage from a natural or human-induced earthquake in 2016. Chances range from less than one percent to 12 percent. USGS map showing (1) the locations of major populations and (2) the intensity of potential earthquake ground shaking that has a 2% chance of occurring in 50 years. This graphic demonstrates that ground shaking from earthquakes is amplified at sites with sediment compared to those with harder bedrock. The upper panel shows ground shaking at bedrock and sediment sites in Washington, DC, from an earthquake in North Carolina. The lower panel shows ground shaking in DC from an earthquake in Alaska. This map shows earthquakes above magnitude 4.0 in the eastern United States since 1973, the first year with a complete catalog. There are 184 earthquakes recorded. An earthquake of magnitude 4.0 or greater can cause minor or more significant damage. The circle sizes correspond to earthquake magnitude, ranging from 4.0 to 5.9 (the largest was in the Gulf of Mexico).